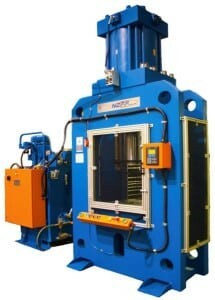 NEFF PRESS® has been providing manufacturing industries with durable, accurate, safe hydraulic presses for over 50 years. 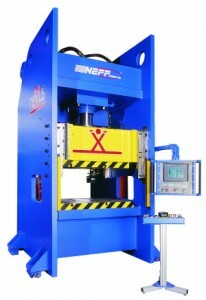 Neff is uniquely capable of building hydraulic presses to solve most custom applications. The standard C-Frame, 2 Post, 4 Post and Gib Guided/Slab Style machines can be fully integrated by their engineers, to meet your requirements. 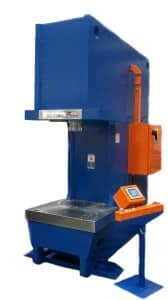 Standard Features Include: Compression unit and metal chip hopper The Compression Unit provides the high- pressure compaction of the metal chips, turnings and swarf. 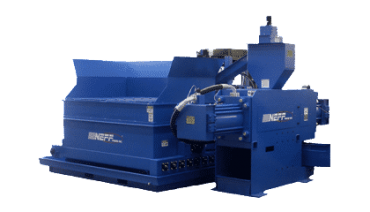 Utilizing advanced hydraulic designs and 50 years of Neff hydraulic experience, the unit provides 30,000 psi on the metal chips in the compression chamber. The MetalBrik system is built with a proprietary dual compression design that compresses on both sides of the metal material in the compression chamber. 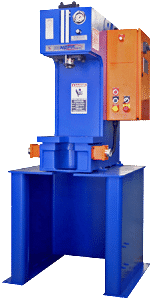 This dual compression produces a stronger, more uniform briquette with less residual moisture and oil. The Neff Press® line of MetalBrik metal chip and swarf compression equipment is available in six standard model configurations as shown in the Grid Below. Custom configurations on all MetalBrik presses are available and will be quoted by the factory based on plant requirements. 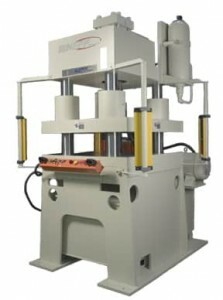 Please visit the optional equipment page for more information. Each MetalBrik system is built with a heavy duty metal chip hopper for volume storage and metered chip feeding into the Compression Unit. The Hopper comes standard with fluid containment tray, floor and cross augers. Augers are the most efficient, trouble-free method of feeding metal chips, turnings and swarf. The augers are equipped with access panels to allow easy removal of debris or larger parts.